Bridge Over Dove Creek at Knickerbocker. Yantis Green Photo. Flood Waters in Dove Creek from the bridge at Knickerbocker. Yantis Green photo. Flood Water Rescue on the San Saba River at Ft. Mc Kavett. Sandy Kothmann photo. 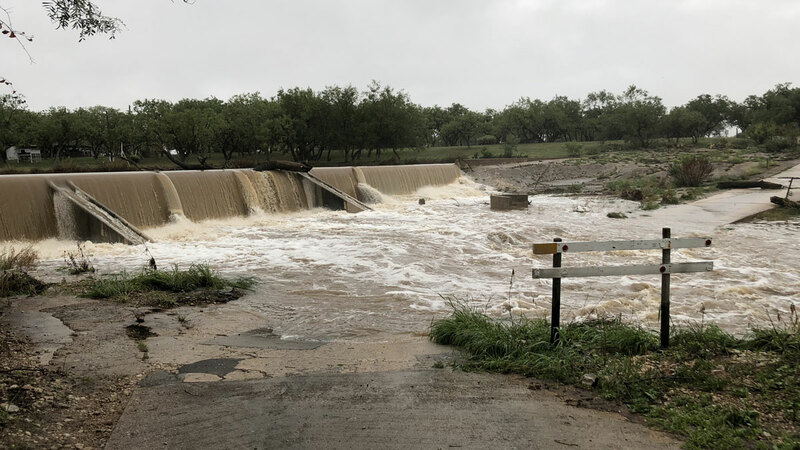 SAN ANGELO, TX -- The week long rainy spell has primed the Concho Valley for heavy flooding when additional rain falls in the next few days and there’s an 80 percent chance of rain. The ground is already saturated and the National Weather Service has issued a flash flood watch for most of West Central Texas through Saturday morning. Rainfall totals vary widely across the area with the NWS reporting 5.75 inches 3 miles southeast of Grape Creek at O.C. Fisher reservoir over the last 72 hours. There was also 6.61 inches recorded 2 miles east of Eldorado. The heavy rainfall in Eldorado even forced the homecoming football game between Eldorado and Winters to be moved from Eldorado to the Old Bobcat stadium in San Angelo. Elsewhere, there was a water rescue on the San Saba River near Ft. Mc Kavitt Friday morning. Three people were stranded in flood waters and were rescued. Sandy Rayburn Kothmann reported the water rescue. Dove Creek was on a rise at Knickerbocker as well. Here’s video of that as well. The flash flood watch is in effect until 5 a.m. Saturday morning. According to the NWS, Showers and thunderstorms with heavy rain producing rainfall rates of 1 to 3 inches per hour. This, in addition to already saturated soils, will result in an increased threat of flash flooding. Additional total rainfall amounts of generally 1 to 3 inches with local 4 inch amounts are expected through late Friday night. Do you have pictures or video of flooding? Send them to us! It is worth noting that Texas Parks & Wildlife game wardens close the gates to the dirt roads around Twin Buttes anytime it rains to prevent their being damaged by vehicular traffic.